The opportunity arose to visit the Jaguar Land Rover Classic Works in Coventry, and I seized it with both hands. Not only would it give me the chance to pore over such iconic cars as the E-Type and Land Rover Series 1 , but it also came with the offer of being chauffeur driven there and back in a Jaguar XF – a most excellent adventure. From a museum point of view, Classic Works is located in a rather unusual spot – Prologis Park is a modern and progressive industrial area to the north-west of Coventry City football ground and is full of hi-tech companies and global solution providers. Mind you, the SVO facility is right around the corner and the Classic Works is not your usual museum. Jaguar Land Rover have turned 14,000 square metres of land space into a purpose-built, state-of-the-art Mecca that is dedicated to keeping the future of classic Jaguar Land Rover alive and, what’s more, it’s the largest of its kind in the world: 54 workshop bays and strip-down areas; a dedicated engine shop; and it has room for 480 of the marque’s automotive gems. 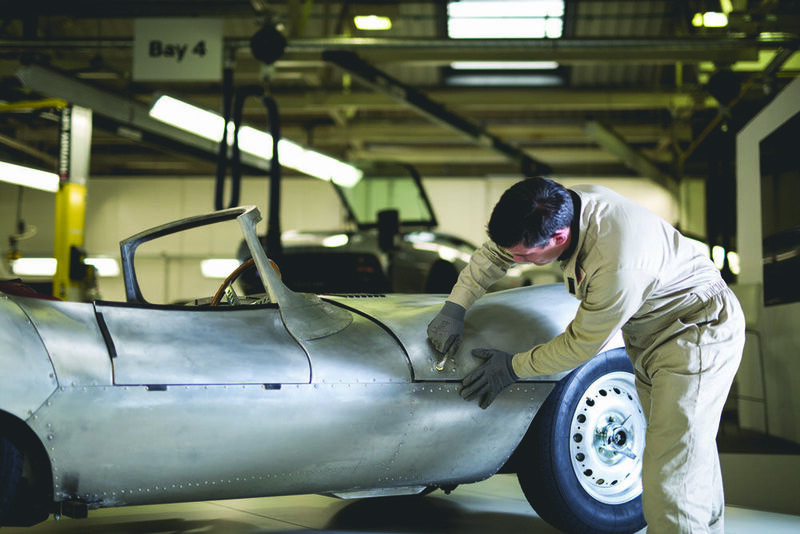 Four specialised teams are at hand to give new life to classic cars, develop new originals (such as the XKSS) plus they hold thousands of genuine parts for those keen weekend enthusiasts out there. We arrived early in the morning and were greeted at the door by the PR team and tour guide. The offer of a flat white was gladly accepted and as I sipped the hot Java, I listened to the day’s agenda and admired the cars that surrounded me. The showroom floor space is filled with JLR vehicles that would take pride of place in any automotive museum anywhere in the world. E-Types, XJS, Series 1 Discos… the list goes on. Most were in Concours condition, a few had certainly ‘seen some life’ and all (and I mean ALL) were up for sale. You see, Classic Works is not so much about keeping these cars alive to be admired behind velvet ropes, it’s about giving them a whole new lease of life. It’s taking the forgotten, neglected or even the abused, restoring them to original (or even better) condition and then rehousing them with new owners. It’s a rebirthing process that will ensure their history will be both seen and heard by generations to come. 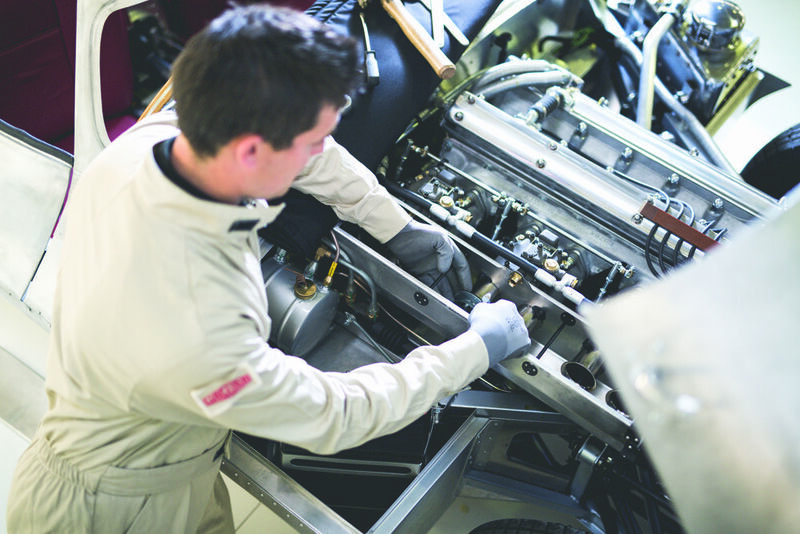 Donor cars are sourced from around the globe and brought to Coventry to be assessed. In an inspection booth and under the guidance of a JLR specialist, clients get the opportunity see the exact condition of the base car they are going to restore, including its history wherever possible. They can then choose what level or state they wish it to be delivered back to them. Some want it as original as possible including the patina and battle scars (but structurally and mechanically sound); others want the full monty, even resto-moded (restored and modernised). Classic Works is at their service. With strict orders not to take photos (mainly because there are clients’ cars around), we headed inside. I knew that the building was expansive, but the actual extent still surprised me. Polished white concrete floors with warehouse-height ceilings, and cars – so many cars – all in various states of undress. A quick look to my right saw a team working on the new original XKSSes; to my left… we would be getting to them last. First up, the upholstery division and the sweet scent of leather. The leatherwork is all done by hand and is predominantly kept to a familiar ‘old’ vein, however, there is a hint of modernisation. You can request frame-feeling originality, but most prefer a little more derriere comfort, with added bolstering and a more in-depth dyeing process. Next up was another jaw-dropper. Although the XJ220 was only in production for a couple of years (1992-94), its impact on the automotive market remains as large as the car itself. A collaboration with race engineering company, Tom Walkinshaw, this near five-metre long two-door coupe boasted 341.7km/h and a ‘ring time’ of 7:46:36. Classic Works has an area dedicated to this supercar monster and there were two being serviced while I watched. Special care and attention had been made to tend to these vehicles, with customised panel mats to ensure zero paint scratches, exhaust extruder pipes and extended rolling roads. If I owned one of these rare beasts, this is the place I’d bring it for sure. Production of the E-Type Jaguar ran from 1961 to 1975. It was deemed ‘the most beautiful car ever made’ by a prominent Italian automotive creator and was so successful that the initial production run couldn’t keep up with orders, so only the rich and famous got them, which in turn made the E-Type even more desirable. More than half a century later, I stood looking at these cars being reborn. Back to bare metal rebuilds, these iconic cars were being lovingly re-created to exact factory specifications and yet still came with their own unique life experience – it was a little mind-boggling and something I could watch for hours. The Land Rover Series 1 was first manufactured in 1948 and its name has gone on to be synonymous with the rugged off-road world. It is a vehicle that has been taken to some of the darkest and most uninhabitable places our green planet has to offer and inevitably holds cult status from those in the know. 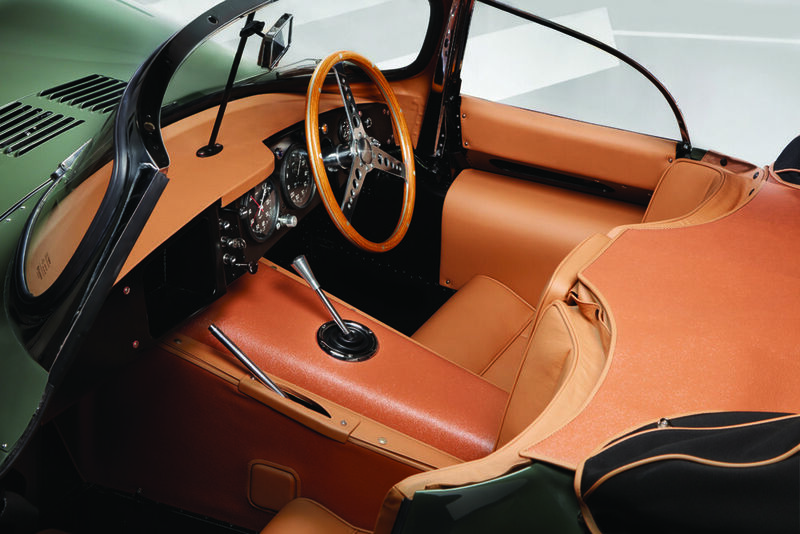 These vehicles have become highly desirable and, again, Classic Works have come to the rescue. Through a network of ‘spotters’, they source the Series 1 from all corners of the globe (and in all manner of condition), bring them back to Coventry where they are stripped back to the chassis and rebuilt – these tough all-terrain vehicles are then ready to begin their journey again – I bet they could all tell a story or two. As a special treat, I was invited to take a look at the rare collection of vehicles stored at the back of the building. It was an eclectic mix of motoring history (300 of which came as part of one collection). Row upon row of mouthwatering motoring nostalgia from a variety of car marques. Movie pieces, concepts and test cars; from the sublime to the ridiculous. We weaved around the area in shopping aisle fashion and there was something on every shelf I wanted. Back in the main facility, we headed up to the XKSS area, I was on the lookout for Phil Harwood, the engineer I met when he delivered the first vehicle to New Zealand. Unfortunately, he was nowhere to be seen, so I had to console myself by leering at the cars themselves. With the tour over, I had a chance to wander around the showroom again and reflect on what I had just seen. The Classic Works is a JLR enthusiast’s dream. If you have your own classic car, it’s a place you can source those hard-to-find parts or bring your own vehicle in and have a specialist take a look (especially the XK220). If you’ve always dreamed of owning a classic Cat or LR, then I challenge you to find a better source, and if like me you’re just a fan, then it’s a 14,000-square metre amusement park (you can also take a trip to Mira and Castle Bromwich … maybe next time for me). Whatever your pleasure, it’s a place where diamonds are unearthed and dreams are reborn.